At this time of year stately homes open up their gardens to the public, and like most people I love meandering among the roses. Whether shrub, climbing or hybrid tea roses - they are all pleasing to the eye and their fragrance is divine. 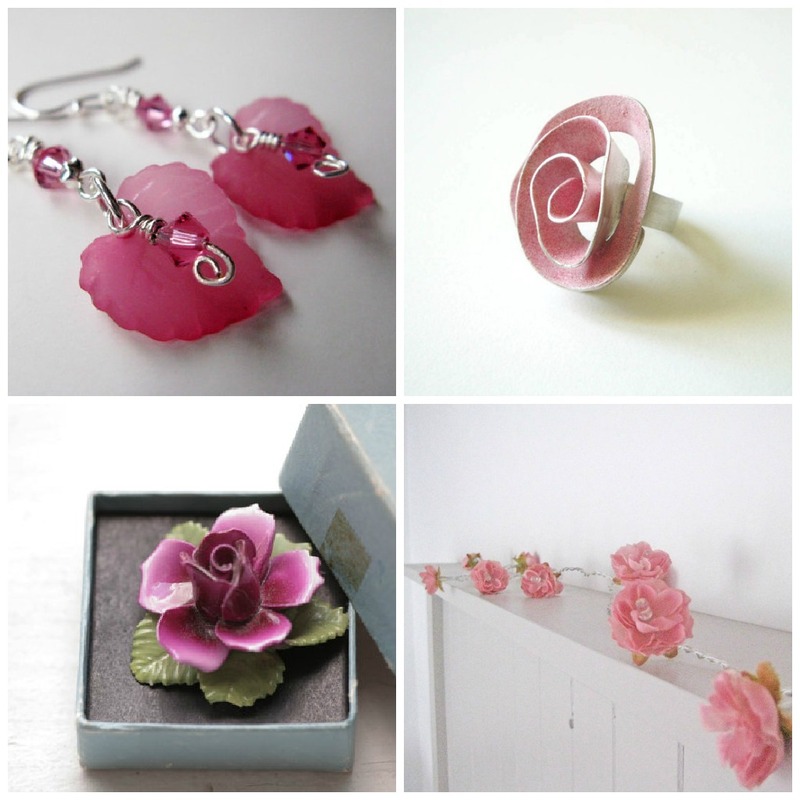 The lovely earrings in dark rose handmade by Sharla of BeadedTail inspired my moodboard today! Um diese Jahreszeit gibt es vielerorts wieder die beliebten Gartentage. In den Schlössern und Herrenhäusern gibt es attraktive Themengärten, wie z.B. Rosengärten. Ob Kletter-, Bush oder charmante Teerosen - sie sind alle eine Augenweide und duften himmlisch. Die wunderschönen Ohrringe in tiefrosé von Sharla @BeadedTail inspirierten mich zu meiner heutigen Collage! Lovely moodboard Duni! Roses especially those that come in pink and white, never fail to catch my attention. Among the four, I love the tumbled flower lights. Wie schön! Vor allem die Lichterkette!! Vielen Dank für deinen lieben Kommentar zu meinem Stag Kissen. Bin mir sicher, dass sich Deine Katzen noch aneinander gewöhnen werden. Bei unseren hat es auch ewig gedauert, bevor sie sich mochten. There is something about roses...I had several rose bushes at my first home--it was so hard to leave them! Thank you for being inspired by my earrings! The roses are so pretty and I am loving seeing so many blooming around here too! What a sweet feature! That ring is really unique. Lovely items for your mood board. Meandering through rose gardens sounds nice. Roses are beautiful, it must have been a wonderful day to walk through those beautiful gardens. Your rose finds are lovely. Perfect pink roses! They always make me think of summer! lovely roses! Beaded Tails' earrings are so pretty!